In the early 15th century, King René of Anjou’s devotion to the courtly arts and literature flourished only after decades of conflict, war, and inter-familial drama. He spent years in prison following a struggle for the throne with his older brother and war with the powerful duke Antony of Vaudémont. A complicated net of alliances and strategic marriages—along with competing claims for the inheritance of several thrones—led to armed clashes until peace was finally established in 1453. Thereafter, René turned his attention to economic and legal reforms—but mostly to promoting arts, literature, and the genteel pastimes of courtly life. His Livre du Cueur d’amours espris [The Book of the Love-Smitten Heart] (1457) is an allegorical romance framed as a dream. The fully-armored Cueur [Heart] sets off with his page Desire to liberate the captive Sweet Grace from the enemies of Love: Denial, Shame, and Fear. Along the way, they confront various challenges, gain new companions, and suffer the loss of others. 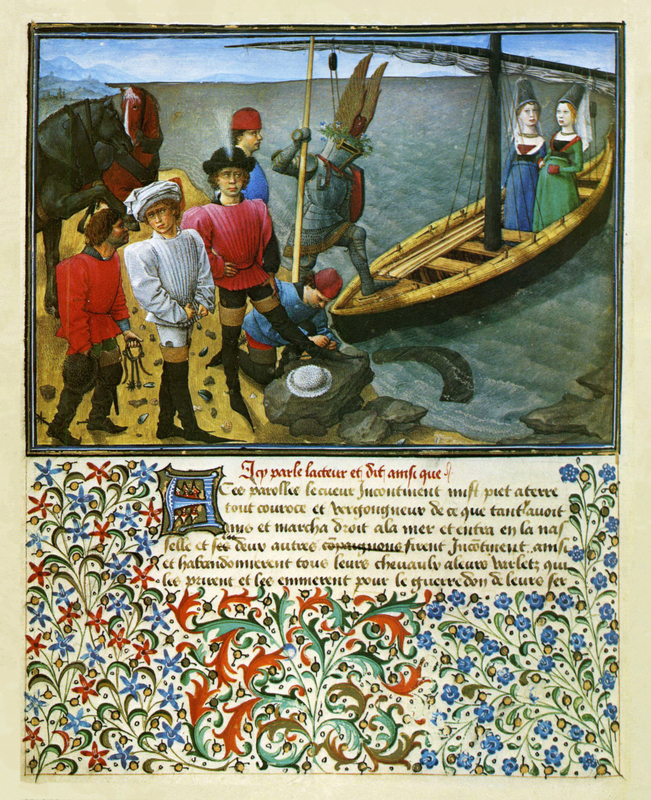 Here, on this page, Cueur is stepping into a boat to head for the Island of Love; his two companion knights, Generosity and Desire, are set to follow. All three have brought their pages. The neighing of their horses has awakened two sleeping women in the boat: Confidante and Accord. The illuminations are likely by Barthelemy de Cler, but a traditional belief is that René himself was the artist, having learned to paint during his time in prison. This entry was posted in Uncategorized and tagged 15th Century, Art, Books, France, Italy, King René of Anjou, War. Bookmark the permalink.